After a long day at work, a yoga session could sound counterproductive but we beg to differ. Practicing pranayams and asanas in the evenings has its benefits by letting you cool down from the day’s drudgery and getting you into a calm zone to enjoy the evening and a restful slumber. At the end of the day, yoga can be practised anytime as long as timings are regular to reap the benefits of this ancient science. We love a1000yoga for its easy access across various locations in the city. The earthy brick ambience is enough to soothe your mind and also the fact that each branch hosts a schedule of evening classes is so convenient for workign professionals. Their evening classes range from hatha to power yoga. Choose from different levels, so that you can start at an easy pace then move on to challenge yourself. Some branches differ in the varieties of yoga they offer, so make sure you check out a branch that suits you. When time is of the essence, combine your gym routine and a de-stress yoga programme into one. Akshar Power Yoga has rigorous sessions that work on your flexibility, strength and conditioning. They claim the sessions can make a visible difference within 15 days, provided you attend regular classes and watch your diet of course. When you want a bit of everything, Ashmayu has an integrated yoga program that takes bits and bobs from various yoga practises targeting stress, anxiety and usual spots for aches. You can even destress and stretch with their anti-gravity yoga class, that works wonders by focusing on your spine, as you hang upside down and let go. Running three classes on alternate days of the week, Total Yoga mixes things up with hatha, vinyasa and power yoga styles. Every class comes with a meditation and pranayama practice, making sure you flow with effortless ease through the week. Known for their high-intensity programs, the yoga classes here offer a slight breather by having a sequence of relaxing movements that help you unwind by focusing on your breath and testing your stamina. Perfect for a start to the week or end of the week, Cure Fit’s yoga class aims to put a stop to your racing mind and bring in awareness to the present. For those who would like to practice Bikram Yoga, the Practice Rooms takes admissions on a routine basis. The yoga poses and postures are timed with a sequence, testing your balance, posture, and alertness. The classes also set time aside for self-practice, making sure you can carry through the routine on your own, as well as interpret it on your own terms. 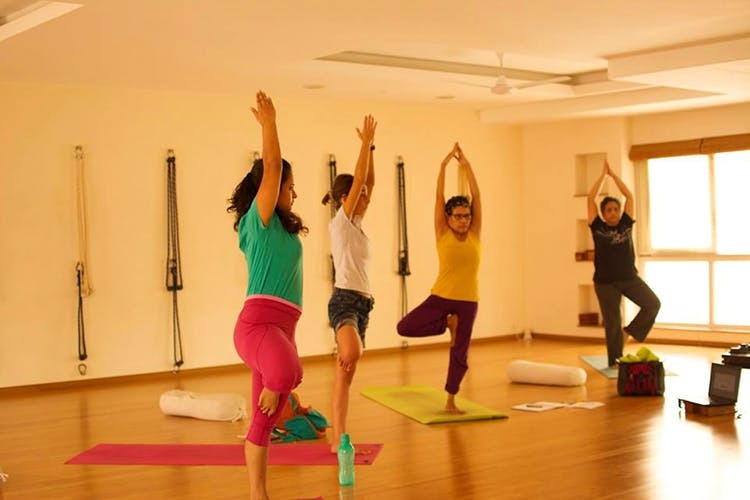 Running regular classes on hatha yoga, Dhrti offers fuss-free sessions where apparently the classes will help you calm your nerves, according to the instructors. If there is a particular ailment that bothers you, the team also carries out yoga therapy all days of the week, which range from back-pain to diabetes and stress management. Throwing in a variety of classes throughout the week, Chaitanya Wellness helps you choose between rigorous hatha and vinyasa flow sequences, relaxing asana and meditation practices, and Shivananda yoga. The centre also offers personal one-on-one sessions across the city. Check with them on where they are located and you could have a personal yoga session at your doorstep. Peaceful settings with no-nonsense yoga, Yogisthaan’s evening class runs only at 7pm on weekdays. Focusing on relaxing and meditation, there are ever-changing themes making sure you have something different to look forward to. Post-yoga class, you might be tempted to savour their nutritious menu of natural juices and smoothies, at the cafe.